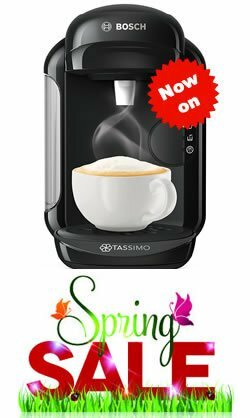 Looking for Cheap Tassimo Machines and Best Offers? Tassimo coffee machines can sometimes be a little confusing or go wrong which stops you getting your delicious drinks when you want them. It is at times like these that you need clear simple instructions so you can get everything running smoothly again and get your coffee, just how you like it. To help, we have provided answers to common issues and links to instruction manuals for your Tassimo coffee machine, just in case you have misplaced them. Below are a list of the most common issues people search for on Google, hopefully, this will save you some time and get your Tassimo back up and running quickly. This one is actually quite easy to fix. The red light comes on when your pod coffee machine needs descaling, we have an excellent guide on how to fix this with a video tutorial or you can follow the instructions below. Fill a measuring cup with 2 cups of hot water. Mix in the Tassimo descaler. You can get Tassimo descaling tablets at places like Amazon pretty cheap. Pour the water and descaler into the empty water tank. Put your yellow cleaning T-disc in the disk draw and close the draw. Use the measuring cup to catch the waste water from the spout. If you do not have a cleaning T-disc you can pick one up on Amazon pretty cheap. Push and hold the start button for about 5 seconds, until you see the red and green light flash. Wait 20 minutes for the cleaning cycle to complete. Once the cleaning cycle is completed, the red light will turn off. Add fresh water to the water tank and run the brewing cycle 4 times to completely clean the pipes and remove any taste from the descaling tablets. Your pod coffee machine is now as good as new and good to go. The water tap light flashes red when either the water tank needs refilling, the water level is too low to make a drink, or when the tank is not fixed correctly in place. Check that the water tank is fitted correctly in place. Make sure the tank has sufficient water (never use carbonated water as the coffee maker runs at high pressure and will most definitely break). Again, this is fairly common and nice and easy to fix. Sometimes milk or coffee/tea/hot chocolate etc can leak from your Tassimo pods and get onto the barcode scanner, this means that your machine cannot read the barcode and so gives you the orange light. Follow the instructions below and you should be up and running in no time. Some people have found that this issue happens when you insert the Tassimo pod prior to turning your pod coffee machine on. This one can be annoying but easy to fix if you know how! If you find that your machine goes straight from auto to standby without completing the brewing cycle, or you need to reset your machine for some other reason, follow the instructions below. Turn on your machine and then release the start button. Insert a T-disc and close lid. Press the start button when your coffee machine goes to auto. An easy fix to this one as well as the solution is all about cleaning. This could be caused by too much limescale and thus you need to follow the steps above to descale your coffee machine. A good way to spot this, other than the red light, is when you see that the overflow which is behind the splash back is leaking. Either way, follow the descaling tips above and you should now get a full cup of your favourite drink, just like when you first bought it. Or, you could have a blocked pipe or funnel. Make sure you clean all removable parts regularly, all but the water tank are dishwasher-safe which makes this incredibly easy. Toothpick – sometimes the funnel where the water comes out of can get blocked by coffee granules, you can remove the coffee granules with a toothpick to allow full water flow again. Making sure you keep on top of cleaning your pod coffee machine will mean that it functions for you perfectly every time you need it. This one is tricky as it is most likely a faulty heating element which will need to be replaced or you will need to buy a new Tassimo coffee machine. However, before you try to replace the heating element or buy a new pod coffee machine, please do try and descale and clean all the parts thoroughly first. The heating element is not designed to be replaced so if you attempt to do this, make sure you know what you are doing – not advised. Unfortunately, Tassimo coffee machines are built as throwaway products and are not designed to have this level of maintenance – our advice is to buy a new one. Sorry that we could not help more with this, but we can tell you how to prolong the life of your water heater element. Do not add water to the reservoir unless the coffee maker has been turned of for at least five minutes. If the reservoir is empty and the coffee maker is left on, the element continues to heat and becomes super hot. When you add cold water it is likely to cause damage to the element. Do this many times and the element will eventually break. 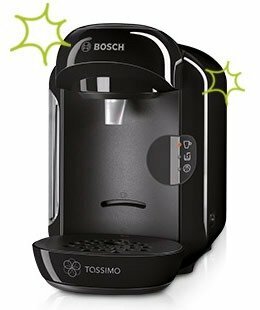 Below are links to instruction manuals for various Bosch Tassimo models, if you have lost yours, hopefully this helps. We hope that this guide has been helpful and you have found answers to issues that you may have been having with your coffee machine. We will keep an eye out for other common problems and add solutions to help you in the future. Is Tassimo being phased out or going out of business? My Virtual Coffee House Copyright © 2019. myvirtualcoffeehouse.com is a participant in the Amazon EU Associates Programme, an affiliate advertising programme designed to provide a means for sites to earn advertising fees by advertising and linking to Amazon.co.uk.